Can the lyrics to a song reveal the secrets of the heart… ? In this sparkling debut, Lisa Tucker takes a fascinating premise–the possibility of reading the future through songs–and uses it to tell the absorbing story of two sisters, struggling to grow up together. If Mary Beth were practicing nearby, I’d be one of her clients. 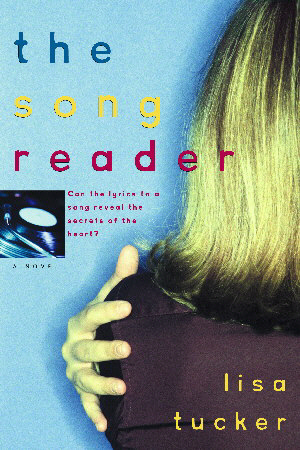 THE SONG READER is a delightful and engrossing novel. — Margot Livesey, author of Eva Moves the Furniture and The Missing World. I’ve just made that most rare and wonderful discovery–a writer at the start of her brilliant literary career. Lisa Tucker is the real deal, my friends, and you’re going to thank me for telling you about her debut novel, THE SONG READER. You’re going to start reading this book slowly, hoping it will never end, hoping you won’t have to say goodbye to Leeann and Mary Beth, Juanita and Henry. This is an achingly beautiful and bittersweet tale about secrets that eat the soul and about the shadow of the past falling across our lives like a shroud. A novel of remarkable wisdom and tenderness, THE SONG READER is about the journeys we take away from and back towards self-understanding. Every splendid page inspires courage.